On March 1, Alchemy will participate in a career fair at the University of Nevada, Reno (UNR) College of Business about 10 minutes from our headquarters. We’ve already hired nine graduates from UNR, and we’re excited to meet our next wave of potential employees from a school and city we appreciate and treasure. When people unfamiliar with Reno picture it, they usually think gambling, mining, the desert, a city in the middle of nowhere, or sometimes Tesla. But if you’re lucky enough to be a Reno resident or student, you think of stunning Lake Tahoe, the Sierra Nevada mountains, the Truckee River running through downtown, the Reno Air Races, the Reno Rodeo, the “Spaghetti Bowl” traffic jam (5 minutes), our mild climate, and a beautiful place to live. 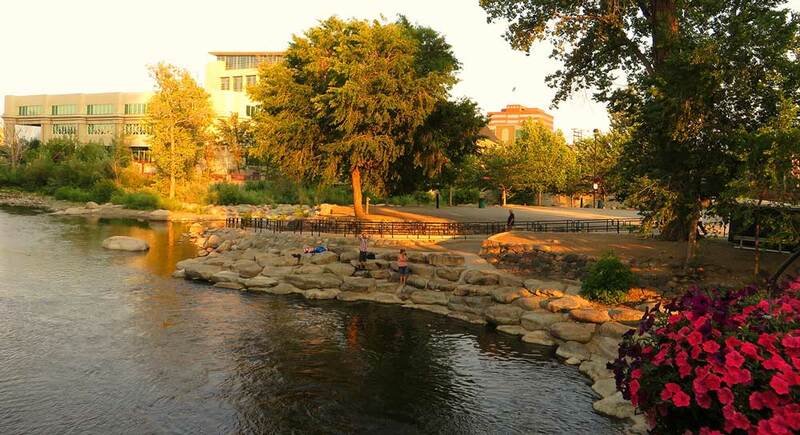 If you like skiing, running, mountain biking, hiking the Tahoe Rim trail, and enjoying the outdoors, Reno is a gateway to all of these activities. The joke around town is that we don’t want to tell any more people how nice Reno is. Alchemy looked at four key factors in choosing Reno for its headquarters: talent, business climate, quality of life, and transportation alternatives. Talent: We recruit primarily from UNR. The School of Business runs an Office of Corporate Outreach, led by our friend Jim McClenahan, that introduces us to high-potential job candidates. The “Noble Nine” we’ve hired to date are highly motivated to learn Workday technology, serve Alchemy customers, and contribute in any capacity to our company. (Read about UNR grad Keith Judd’s experience here. We will be hiring more UNR graduates this year, and we could not be more impressed with the aptitude and attitude we find in Wolfpack graduates. Business climate: Reno and Nevada offer a very business friendly climate. Corporate and personal tax structures support the creation of jobs and allow workers to keep more of their salary because there is no state income tax. Governor Brian Sandoval is committed to Nevada being a compelling place to do business. Additionally, the state has a smaller, more intimate local government feel. We talk to human beings when we have tax questions, business licensing is a simple process, and we feel like our job creation is valued by state leadership. When Alchemy moved to Reno we discovered an amazing organization devoted to helping businesses thrive here: the Economic Development Authority of Western Nevada (EDAWN). From Day One, EDAWN provided us with meaningful access to the business community and instant access to decision makers in state and local government when we had challenges and questions. Quality of life: Many of our employees and their families are putting down roots in Reno and enjoying a change from the hectic pace of big cities. I enjoy skiing, trail running, mountain biking, camping, and hiking, and I can do all of this within 45 minutes of our office without fighting crowds. Housing costs are starting to rise but are half the cost of a comparable home in the San Francisco Bay Area. Transportation. Reno has an easy-to-navigate airport, plenty of parking, and the nicest TSA staff you can imagine. The big carriers fly our consultants all over the U.S., and the airport is generally not affected by severe weather. Interstate 80 runs to Sacramento and the Bay Area, and while Donner Pass can be tricky driving during the winter, Southwest Airlines offers nonstop flights to Oakland and SFO. The traffic jams we complain of here in Reno are laughable compared to driving in a large city. If you’ve never considered Reno, come visit. It’s a great place to build a business, find talented employees, and enjoy a work-life balance. If you love the outdoors and exploring nature, this is one of the most accessible and beautiful places in America. But don’t tell too many people about our secret!